SylvanSport’s PRO-GO Getter program rewards GO pop-up camper enthusiasts and industry insiders with a steep PRO deal and generous referral fees. With the PRO-GO Getter program, we’re taking the GOs out of the showroom and out into the real world, where they belong. Brevard-based company SylvanSport, makers of the lightweight pop-up camping trailer, the GO, have announced an exciting new “PRO-GO Getter” program that helps GO fans with industry connections become GO owners and brand ambassadors, with the potential to earn referral fees. It also helps put more GOs on the map, for aspiring GO owners to explore and experience firsthand. The GO pop-up camper is designed from the frame out to be a one-of-a-kind mobile adventure trailer that’s even more versatile than a Swiss army knife. On their website, SylvanSport illustrates how the lightweight GO, called the “Coolest. Camper. Ever,” by National Geographic Adventure, tows behind any vehicle, including hybrids, and hauls bikes, kayaks—even motorcycles—before transforming into a comfortable camping trailer with a living space that can sleep 4 with ease. For qualified PRO-GO Getters, the benefits of being a brand ambassador for the GO camping trailer are many. 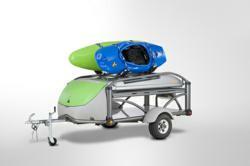 “SylvanSport is born of roots in the outdoor industry, so we’ve always had a great Industry PRO Deal on the GO Camper. Our new PRO-GO Getter deal takes that many steps further, giving our industry friends all the tools needed to be great ambassadors for the GO, and earn some real money in the process,” said Dempsey. To see a 365-degree view of the SylvanSport GO camping trailer, plus live videos demonstrating the versatility and design innovation of the GO camping trailer, and for applications and more information about the PRO-GO Getter program, visit SylvanSport.com.